My neighbor has seen my cakes on my Facebook profile, and recently decided to ask me to make her daughter's birthday cake. I was so honored that she would think of me when she wanted such a special and creative cake. 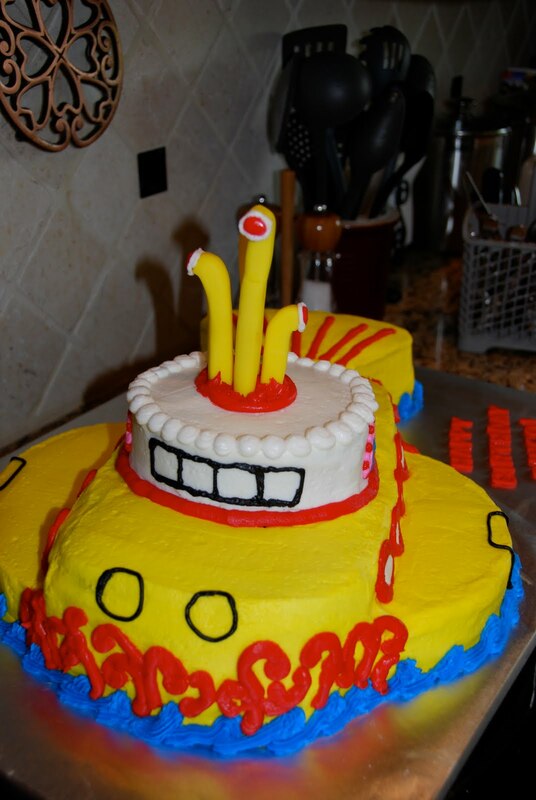 When she told me her soon-to-be-4-year-old little girl wanted a cake resembling The Beatles' Yellow Submarine, I was really surprised! I must admit, I had to do some extensive research for this one. I haven't ever seen the movie or the album cover. I checked out www.imdb.com first, and thought, "Goodness! How am I going to make THAT into cake?!" Then I went straight to www.cakecentral.com to see if anyone else had some cake submarine ideas I could incorporate. Then, of course, I consulted my husband for the "engineering" portion of the design process. Because he's truly brilliant. (For some reason, it took me forever to wrap my brain around the shape.) And, last-minute, but not least, I had my teenage son fire up the Beatles' Rock Band and show me the "Yellow Submarine" song. Scrolling on the bow, British flag & propeller on the stern, fondant periscopes on the top. As far as the structure, this cake was a bit more complicated than most. The main part of the body was two layers. I baked a large rectangle cake and a contoured race car shaped cake. Then, I baked a 10-inch round cake and a 6-inch round cake. I put the race car on top of the rectangle, and carved them to be the same size. I also used part of the leftover rectangle pieces to make the triangle-shaped tail. I cut the larger round cake in half to make the sides, and put the smaller cake on top. I should've taken a photo of it before I decorated it. It almost looked like a whale. Oh, and one last request from the birthday girl. 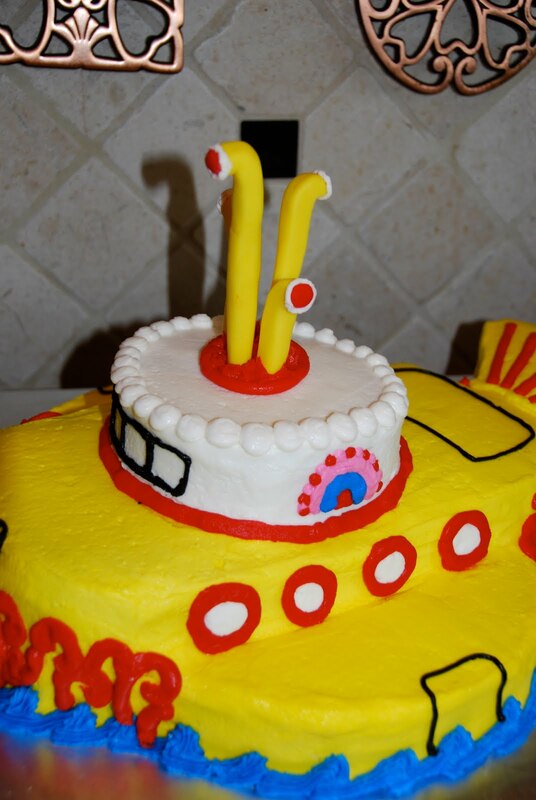 It has to say, "Happy birthday, RINGO!" I have to say I love this! Yellow Submarine is my 3 year olds favorite song and he would totally flip out! I think its beautiful and just awesome. So Good job!!! your cakes are amazing. I really love that dear little teapot! I LOVE your cake! It is brilliant! I have featured you on "Water Get Crafty"